Andrea Pető is Professor in the Department of Gender Studies at Central European University, Budapest, Hungary and a Doctor of Science of the Hungarian Academy of Sciences. In 2005, she was awarded the Officer’s Cross Order of Merit of the Republic of Hungary by the President of the Hungarian Republic and the Bolyai Prize by the Hungarian Academy of Sciences in 2006. In 2018, she received the 2018 All European Academies Madame de Staël Prize for Cultural Values. Pető is editor of 31 volumes and author of 5 monographs, as well as 261 articles and chapters in books published in 18 languages. Her recent works include Political Justice in Budapest after WWII (2015, co-authored with Ildikó Barna), Gendered Wars, Gendered Memories: Feminist Conversation on War, Genocide and Political Violence (2016, co-edited with Ayşe Gül Altınay) and the volume on War in the Interdisciplinary Handbook: Gender series (Macmillan, 2017, edited). She is on the editorial board of 6 international and 2 Hungarian academic journals. She also serves as an associate editor for The European Journal of Women’s Studies. 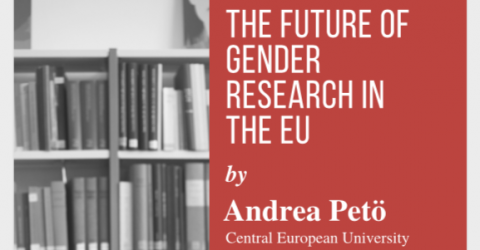 Andrea Pető served as a coordinator of training as a Core Group Member of GenderSte, COST Network of Women in Science, Technology and Environment and member of Horizon2020 Societal Challenge Advisory Group (2014-2016, 2016-2018) and as a member and Vice Chair of Advisory Group on Gender (2014-2016, 2016-2018). She also served board member (2009-2014), co-president (2011-2014) of ATGENDER - The European Association for Gender Research, Education and Documentation. In the Hungarian Academy of Sciences, she is the chair of the subcommittee on history of Second World War and member of the Presidential Committee of Hungarian Academy of Sciences on Female Researchers and Life Course.